Scott Dixon is the 2018 IndyCar Series champion! Scott Dixon (Chip Ganassi Racing) is the 2018 IndyCar Series champion! 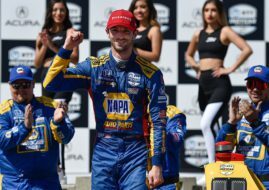 The 38-year-old New Zealander finished second in the #9 Dallara-Honda in the season’s finale at Sonoma Raceway to take his fifth championship title in the premier North American open-wheel competition. Dixon became only the second man in the history to win five IndyCar championships, only legendary A.J. Foyt has more (seven titles). Dixon won all titles with Chip Ganassi Racing. For the team, it’s the 12th IndyCar driver’s title. Ryan Hunter-Reay (Andretti Autosport) has won the Grand Prix of Sonoma in the #28 Honda after leading for 80 of 85 laps at the 2.385-mile circuit. It was his second win this season and 18th in a career. Dixon started the race from the second place, knowing that he has a 29-point championship lead ahead of Alexander Rossi (Andretti Autosport). It all went wrong for Rossi early in the race when he damaged the front wing on his car and punctured a tire in the first-lap contact with teammate Marco Andretti, dropping to the back of the field. After that, he recovered to the seventh place but it was clear that Dixon will have a celebration after the race. In the end, Dixon won the title with a 57-point advantage. Will Power (Team Penske) finished third in the race and third in the championship with 582 points, ahead of Ryan Hunter-Reay (566) and Josef Newgarden (560). The 2019 IndyCar Series season will again consist of 17 races. For the ninth straight year, the opening race would be the Grand Prix of St. Petersburg, on March 10. The season’s finale will take place at Laguna Seca on September 22.